The Menagerie is bringing an international flavour to their October show. Wellington’s monthly variety show, The Menagerie, prides itself on showcasing the best of Wellington’s unique and talented live performance. Their October 25th show is going to take it a step further with many performers from beyond our shores. Included in October’s line up is Lucas Monge a magician from Argentina, Jack Carty a singer/songwriter on tour from Australia, comedian Neil Thornton from the United States who has now made his home in Wellington, and another American, The Reverend Doctor Vinyl Burns who will be DJing as the audience come in and doing a set from his extensive repertoire of performance skills. Also on the bill is Charlie Atlas the strongest man in sideshow from Scotland, and a contingent from the upcoming New Zealand Improv Festival featuring local, national and international improvisation performers. The show will be hosted by Rachel Renegade the pain proof princess from England. Rachel Renegade and Charlie Atlas have come to New Zealand to tour with The Pretty Things Peepshow. 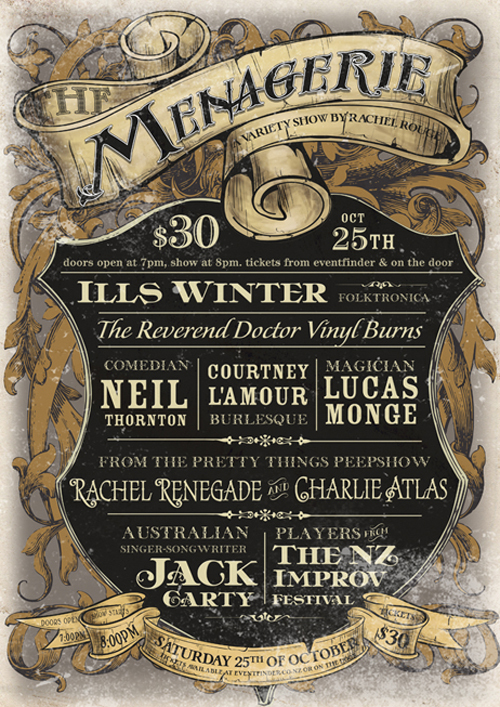 The October 25th show will also feature Wellington crowd favourites: award winning local burlesque legend Courtney L’Amour and ethereal folktronica band Ills Winter. The Menagerie is a variety show at The Fringe Bar on the last Saturday of every month. Tickets are $30 and available at Eventfinder or on the door.